From 4th March 2017. Closes 27th March. Glenys describes herself as ‘a person of mature years and sober habits, with one husband, two children, three chins, and multiple interests’. These include painting and drawing, writing (a book of short stories called ‘Yum Yum Pigs Bum and other tales’), eating, music, movies, community involvement, eating, reading, travel (she and her husband have lived and worked in both the UK and China), and have I said eating? 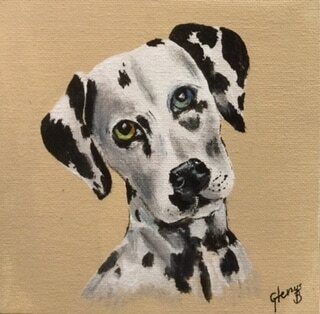 Glenys works primarily in acrylic and watercolour, but also enjoys using pencil, pen and ink, and mixed media. She is currently enthusiastic about exploring different experimental watercolour techniques. As a member of Marion Art Group, one of the larger groups in the Adelaide metropolitan area, and also of The Red House Group, Glenys has exhibited frequently and sold much of her work (see examples on the Marion Art Group website marionartgroup.org) She has been president of the Marion Art Group for the past seven years. One of Glenys’ long held beliefs is that it’s important to have fun with your creativity. After all, she says, it’s just a piece of paper or a canvas – turn the paper over and use the other side, or paint over the canvas if you’re not happy with the final result. So many people only paint the familiar, using subjects and materials they’ve used before. This certainly isn’t conducive to personal development. Build on the skills you already have and don’t be afraid to experiment. See this put into practice in her work, which ranges from traditional animal portraits and fantasy works, to Oriental influenced flower and bird paintings, and ‘different’ watercolours. Donuts, Acrylic on canvas, Glenys Brokenshire. Furry Friend, Acrylic on canvas, Glenys Brokenshire.